A Bamboo build job can be run on an elastic agent, provided that the capabilities of the elastic agent meet the requirements of the job. Bamboo will assign the relevant job to an available elastic agent from the build queue automatically. The elastic agent must already be running for a job to be assigned to it. An elastic agent is started by creating a new instance of an elastic image. Creating this new elastic instance automatically runs an elastic agent process in the instance. The agent inherits the capabilities of the image it was created from. Only one agent process can be run in an instance, although multiple instances can be created from the same image. Once a job has completed running on an elastic agent, its results are made available (like those of any other job executed on a non-elastic agent). The elastic agent and instance will continue to run until they are shut down. Shutting down an elastic instance will terminate the agent, not take it offline. However, Bamboo will store historical information about the terminated elastic agent, such as the job which it has run. 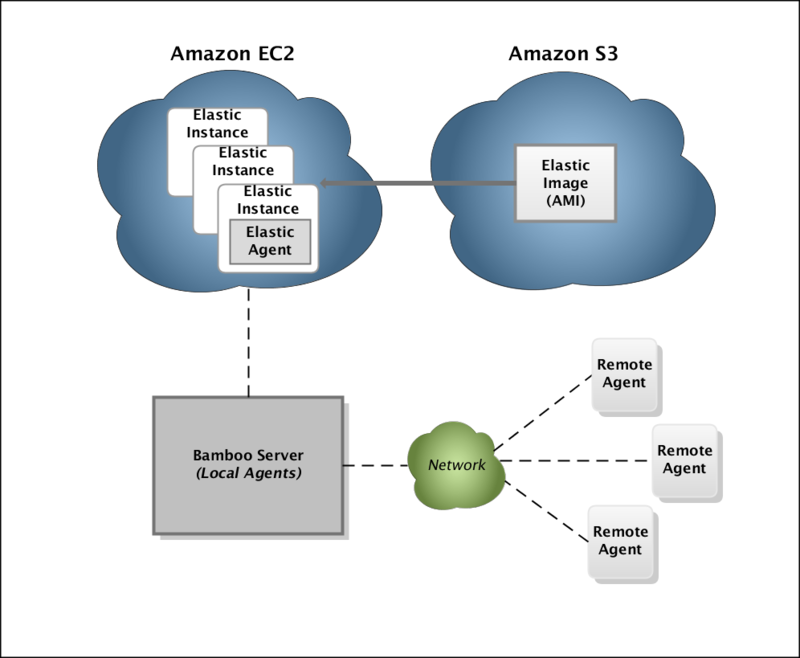 An Amazon Web Services (AWS) account is required to use Elastic Bamboo. Elastic Bamboo Costs are charged by Amazon, separate to Bamboo license costs, as Elastic Bamboo is powered by Amazon resources. Did you know you can configure Bamboo to start and shut down elastic instances automatically, based on build queue demands? Please refer to Configuring Elastic Bamboo for more information. An elastic agent is an agent that runs in the Amazon Elastic Compute Cloud (EC2). An elastic agent process runs in an elastic instance of an elastic image. An elastic agent inherits its capabilities from the elastic image that it was created from. If you would like to set up Elastic Bamboo for your Bamboo installation, please read Getting started with Elastic Bamboo. This document guides you through the initial configuration of Elastic Bamboo and running your first Job build.